Best foot forward: Male representatives from St Helens Council and Helena Homes donned women’s shoes to take part in a ‘walk a mile in her shoes’ event. As a White Ribbon authority, St Helens Council once again showed its full support to White Ribbon Day, a national campaign which seeks to eliminate violence against women. Held each year on 25 November, White Ribbon Day was set up by a group of men who wished to take a stance and make a visible, personal pledge never to commit, condone or remain silent about violence against women. 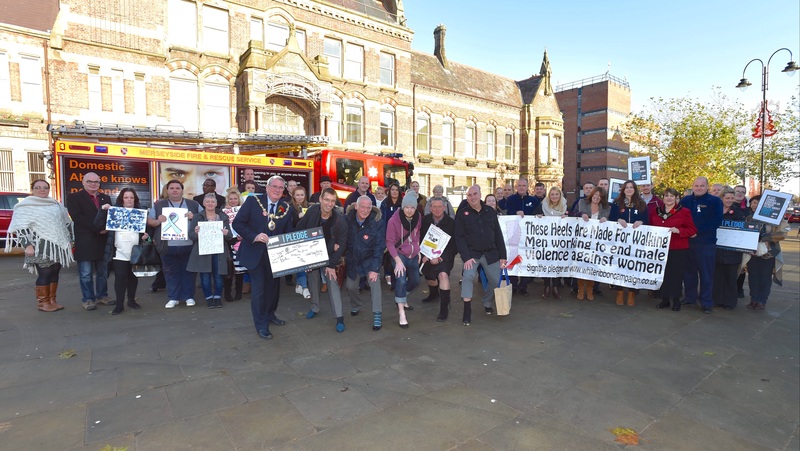 To highlight this, male representatives from St Helens Council – including Earlestown ward councillor, Charlie Preston – and community safety partner agencies, swapped their shoes for stilettos and embarked on a walk around the town centre as part of a ‘walk a mile in her shoes’ event. White ribbons are also being displayed in council buildings and on council vehicles –and the White Ribbon flag is flying above the town hall. Local agencies will also be taking part in a unique training event on Monday 5 December which will see a compelling theatre production of ‘Mockingbird High.’ Produced by Certain Curtain Theatre Productions, the play examines patterns of abusive behaviour and its long-term impact on children. 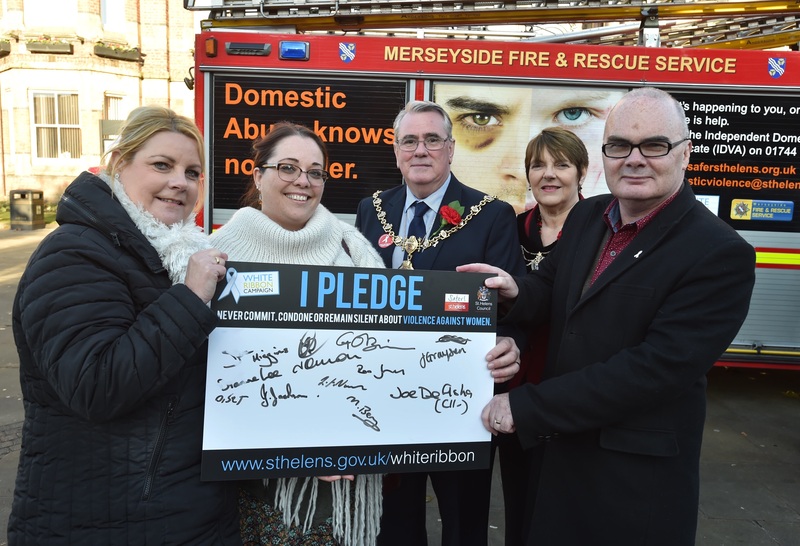 St Helens Council’s Cabinet Member for Safer Communities, Councillor Lisa Preston, said: “The council, along with our community safety partners, fully support the aims of the White Ribbon Campaign. We continue to work to identify those who are victims of male violence and strive to ensure we hold perpetrators of violence to account for their actions. Residents, particularly men, are also being encouraged to sign the White Ribbon pledge to vow never to commit, condone or remain silent about violence against women. To sign the pledge and for more information about the campaign, visit: www.sthelens.gov.uk/whiteribbon. If you or someone you know is a victim of domestic violence; help is available. Call the Independent Domestic Violence Advocate (IDVA) on 01744 743 200. If your behaviour is hurting someone and you want to stop. Contact the RESPECT helpline on 0808 802 4040. Pledge: (left to right) Councillors Lisa Preston; Jeanie Bell; Mayor, Dave Banks; Mayoress, Jeanette Banks and acting council leader, Andy Bowden, were among those to show their support.